While growing up in a small fishing village, I became curious in what was hidden beneath the surface of the ocean. When I became older I therefore decided to learn scuba diving at the National Life-saving Association of Iceland. I then joined its voluntary rescue team in Reykjavik and later became its diving group leader and instructor for the association, besides diving with other police officers. Members of the diving group took also part in other marine search and rescue operations than diving, and we were quite busy with about 30 call-outs per year. The team got a special permission to dive in Nicholas’s rift in Thingvellir if we instead cleaned the rift for junk, mostly empty bottles, and did not touch the coins, which people had thrown into the rift. To dive there is very special because the water is crystal clear and therefore the visibility is extremely good. The water comes from the glacier Langjokull, which is far away, and becomes clean spring water by flowing underground. It takes 20-30 years for water to run from the glacier to the rifts and then into lake Thingvallavatn. The Eurasian and North American plate boundaries run through Thingvellir and are moving away from each other, so we were diving between two continents. 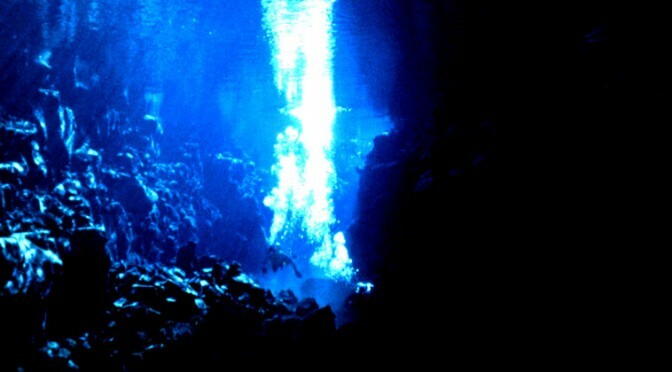 Diving is now only permitted in two submerged rifts in Thingvellir, Silfra and David´s rift. I have not dived in Silfra but it looks very similar to Nicholas’s rift according to photos I have seen. I have dived in David´s rift which is very interesting. It’s in lake Thingvallavatn and first I dived through murky water, but when I entered the rift the water became very clear and I saw trouts swimming around. Thingvellir is a national park and is on UNESCO’s World Heritage list. All major events in the history of Iceland have taken place at Thingvellir. The Icelander’s General Assembly at Thingvellir, the Althingi, was established about 930 AD and was the supreme legislative and judicial authority. Most inhabitants were heathens (Norse mythology) though some were Christian. In the summer of 1000 chaos threatened the society as the members of Althingi were split into two groups, heathens and Christians. Each group had its own Law Speaker and refused to acknowledge the laws of the other group. The speakers agreed that Thorgeir Ljosvetningagodi, the heathen Law Speaker, should decide which religion all Icelanders should follow. He declared that Icelanders should take up Christianity, though those who were heathen might continue to practice their religion in secret. This is why Icelanders became Christian in a peaceful way. The foundation of the Icelandic republic took place at Thingvellir on the 17th of June 1944, the birthday of one of its national heroes, Jon Sigurdsson.